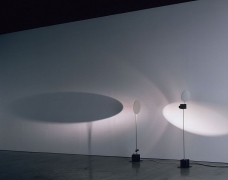 Sean Kelly Gallery is delighted to announce a major exhibition of new works by Rebecca Horn. This is Horn's first solo exhibition in New York since 1998 and her first since joining Sean Kelly Gallery. Horn's exhibition is comprised of several large-scale sculptures and a series of new photographic works. 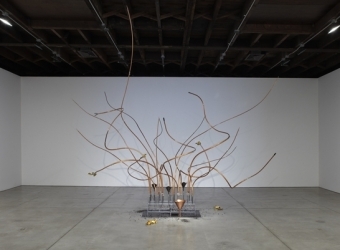 The installation in the first gallery, constitutes a new direction in her work incorporating moving imagery and water, whilst in the main gallery Horn orchestrates three important new mechanical sculptures. In a group of new photoworks, Horn utilizes a camera that double-exposes each frame. She then overpaints the picture and re-photographs them, resulting in complex overlaid fragmented images that are enigmatic, poetic and deeply intriguing. Rebecca Horn, (born in Germany in 1944), is without question one of the seminal artists of our time. Her work, which ranges over a wide variety of media including film, performance, installation, photography and sculpture addresses themes of perception, philosophy and communication. The employment of such wide ranging interests as science and alchemy, the rational and the intuitive, the mechanical and the sensual has occurred repeatedly in her work over the last three decades and resulted in one of the most distinct and individual oeuvres in the art world. 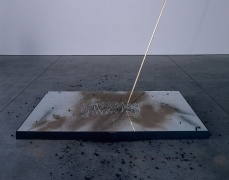 Horn has participated in the Venice Biennale, the Biennale of Sydney, and is one of very few artists whom have been selected to participate in Documenta on four separate occasions. Horn's work is included in many major public collections worldwide including: The Solomon R. Guggenheim Museum, New York; Museum of Modern Art, New York; Art Gallery of New South Wales, Australia; Castello di Rivoli Museum of Contemporary Art, Torino, Italy; The Tate Gallery, London; San Francisco Museum of Modern Art, San Francisco; Musée National d'Art Moderne, Centre Georges Pompidou, Paris; the Stedelijk Museum, Amsterdam and the Van AbbeMuseum, Eindhoven.